Plug your Arduino into a computer via USB and have a script running on your computer that uses the aforementioned email-to-SMS gateway method. Unfortunately, these methods are either expensive, require somewhat complicated code (depending on your coding abilities), or both. The last two options also require you to be within range of an internet connection or a computer, which isn’t always possible. Fortunately, there is another option that is cheap, requires only basic code, and allows you to use it anywhere you’ve got power and cell service: use your Arduino to interface with a cell phone over a serial connection. In this tutorial we’ll be using the Motorola c168i, which can be found on Craigslist or eBay for less than $20. You may also be able to use Motorola’s C257, C261, V175, V176, V177, C168, W220, and W375, as they share the same serial connector. You might be able to use another kind of phone provided it has a serial connection (very uncommon in newer phones), but it will likely have different serial pinouts and / or a different set of supported commands. 1. Set up your C168i. You’ll need to make sure that your Motorola C168i is working properly and that you can send text messages from it. If you browse the phone’s settings, you can choose to do a master reset as well as initial phone setup. Set up your C168i according to your carrier’s settings, and ensure you can send a text message from the phone itself before continuing. 2. Solder wires to your connector. 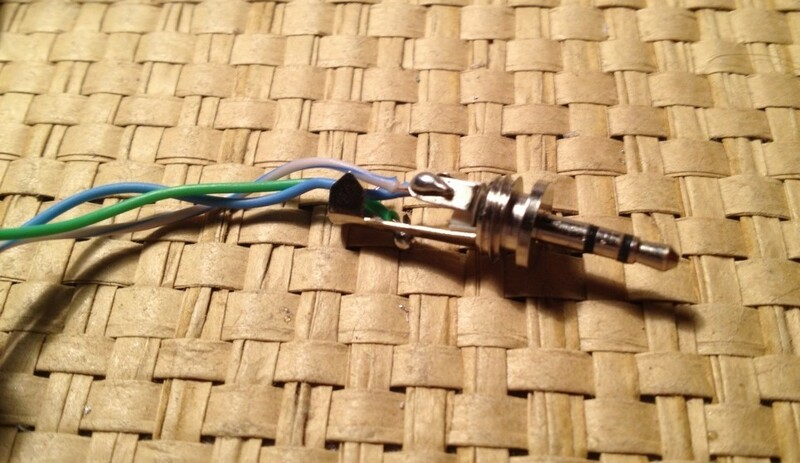 You’ll want to solder one wire to each of the three connectors on your 3/32 headset plug. The tip connector will be our serial TX connection, the ring connector will be our serial RX connection, and the sleeve connector is our ground connection. In this photo, my blue wire is TX, white-blue wire is RX, and green is ground. Use a multimeter to figure out which pin connects to which part of the connector if you’re not sure. Connect the TX to pin 2 of your Arduino, connect the RX to pin 3, and connect the ground connection to GND. Connect your pushbutton to pin 8. Make sure to use the pull down resistor, or you may get false readings. See the image below for a wiring diagram. 4. Modify & upload the code. Substitute the phone number for your own in the example code (found at the bottom of this post) and upload it to your Arduino. 5. Plug it in and test it out. Plug the 3/32″ headset plug into the headphone jack on the top of the phone and push your button. The on-board LED (13) should blink when the message has been sent. You can verify this by going into the phone’s outbox. If the message doesn’t send, or the message doesn’t appear in the phone’s outbox, double check your wiring and ensure there are no broken or shorted out connections, especially in your headset plug. You can also try unplugging and re-plugging the headset plug. The example code is fairly basic. It uses the SoftSerial library (included with the Arduino IDE) to set up a software serial connection on any pins that we want. 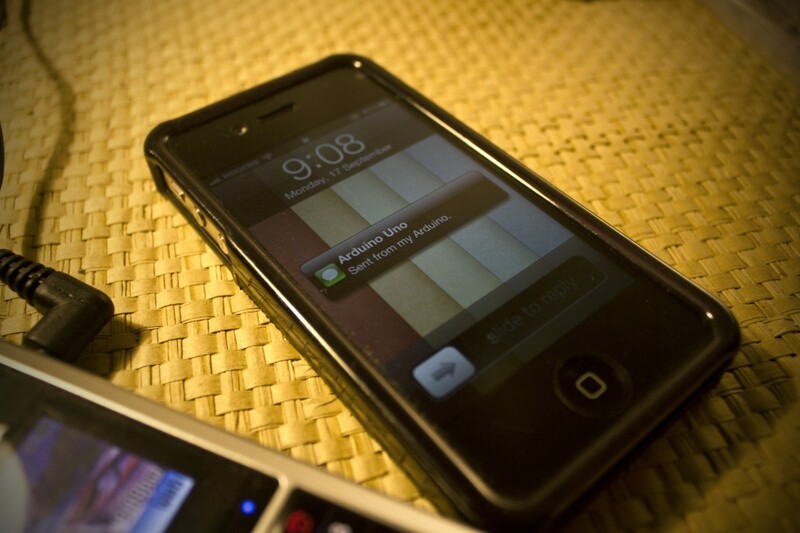 Once we establish the serial connection, we use AT commands to wake the phone up, enter text mode (as opposed to data mode), create a new text message, and then send it to the appropriate phone number. We then wait 10 seconds, giving the phone enough time to send the message, and then delete the message from the phone’s outbox. digitalWrite(13, HIGH); // Turn LED on. digitalWrite(13, LOW); // Turn LED off. Note: I have disabled comments for this post because people are mostly asking questions that I have already answered in the post itself, in the comments, or that I can’t answer at all – mainly about what phones will and will not work for this project (the only ones I know that will work are listed above). If you’ve read through the post and all the comments and still have an issue then feel free to send me an email. Categories: Arduino, Tutorials. Tags: Arduino, C168i, featured, Message, Motorola, Send, SMS, Text. This is pretty awesome. 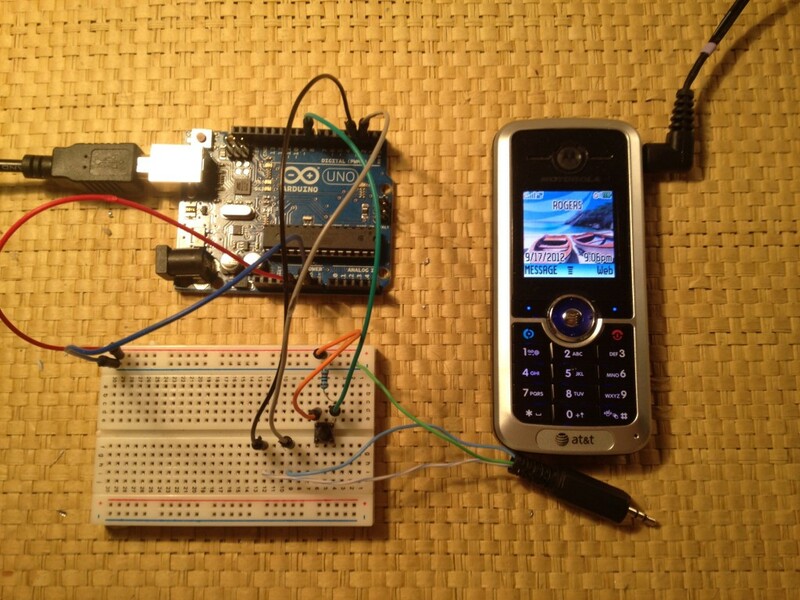 Do you know if the phone can send SMS back to the Arduino over Serial? 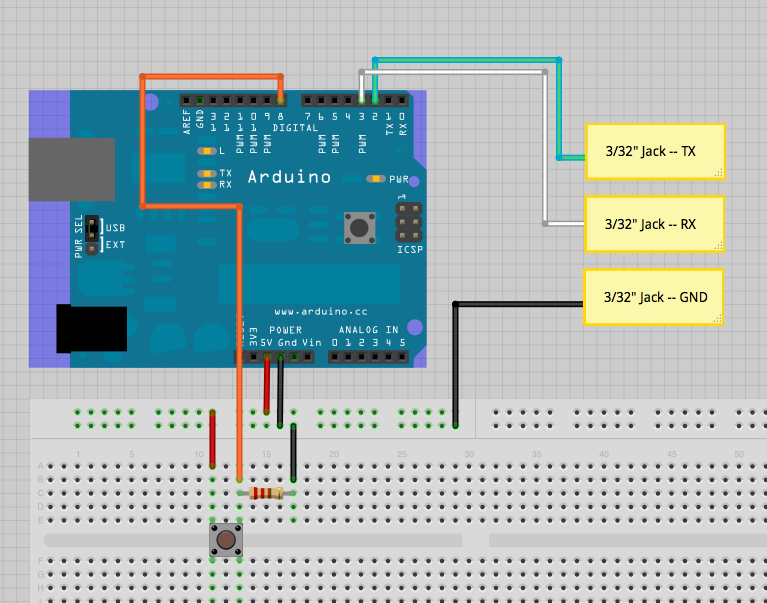 That way you could interact with the Arduino over SMS? I believe it’s possible, but I haven’t looked into it yet. It appears, according to page 3-70 of this document that there is an AT command that’ll let you read messages. I know that Matt Sheffield was working on that functionality, so maybe give him a shout? If you figure it out, I’d love to see the results. So, in practical terms, you have an Arduino watching something- maybe a sensor on a garage door so you know when your spouse comes home- something. The event happens and the Arduino texts you that it has. That part I get. The phone part I do not. Warning! Stupid questions follow! “A working SIM card”. There is one in my phone- but that is the phone I want to receive the text on. Do I have to have service for two lines? Can I duplicate the SIM in my current phone, put the duplicate into my e-Bay cheapie and more or less text myself? I’m not clear how the phone end of it works in a day to day sense. Additional service sorts of busts your $20. As far as I know, you can’t duplicate a SIM card. A SIM card can only be registered on a network once, and that’s to keep people from duplicating their cards and sharing them with their friends so they don’t have to get their own service. If you can’t use your existing SIM card, then yes, you’ll have to get a new one. Your options entirely depend on your carrier. Personally, I use a pay-as-you-go account, which cost me $10 for the SIM card. Some carriers give them away for free. You might also see if you can set it up as a family plan or something, where the cheap new phone draws from your existing text message package. The $20 was a startup materials cost. It’s impossible to predict how much it’ll actually cost everyone, there are too many variables; location, carriers, carrier rates, how many messages people will send, how long they’ll keep it going, etc. by way of example, you can get a pay-as-you-go phone at W*lmart for about $15. Veriz*n has a pay-as-you-go plan that runs $30/month, but you can pre-pay $100 and you are good for a year, or until you use up all your credit. Typically, accessing the network costs $2 each day and calls and text messages are some nominal amount comparable to other plans. So, for example, if you set up the Arduino to send a text message only every 3 or 4 days with the tempreature in your cabin, or if it dropped below 40 degrees F, you could monitor the cabin for about half a year, so about $16/month. I think there are strictly SMS plans that might cheaper. I have no idea what you’re asking me. Very interesting work, but i would like to know if someone could help me to adjust this code for Motorola V360V, because i can’t find any of this models you mentioned? Thanks for this wonderful page. I am building a SMS based temperature alert system based on this page. Excuse my poor knowledge in embedded programming, but I have a doubt. The temperature sensor is an analog input right? So how do we replace the “if (digitalRead(8) == HIGH)” expression so that it will serve my purpose. I want an alert SMS to be sent when temperature crosses 25 degree celsius which corresponds to 250mV output from the sensor. Do we need to initialize the pin as analog? Now that I came to know about the examples page of arduino website, I think I can tackle almost any problem I get on my way. Appreciate the help. By the way, the phone I acquired for this project is Motorola C168, not C168i. It will still work, right? According to google, they are identical, so it should work. Although I can see the LED blink, No SMS was sent. I am powering the board using usb from computer. There was also one more difference in what I did. I did not use a resistor, I just connected pin 8 to 5V of the arduino for a second directly. Check out step 5 above. if I want to do a simulation, what software can I use? i want to ask..if i use nokia 3310…i can use the same code as above? Depends if the Nokia has a straight serial connection available, and if it accepts AT commands. I copied your sketch on my arduino uno and connected a Motorola C261 as you descibed. Besides some beeps it produces nothing. I also tried to read out any data from the software serial, without any success. Make sure you have your set to the correct baud rate. Other than that, I don’t know what to tell you other than make sure all the connections are correct. can i use anothor phone (samsung, nokia) to replace motorola 168i ? Some people have gotten other phones to work, yes, but you’ll have to do a bit of research. This tutorial is only for a select few phones by Motorola. is this not require rs232 to ttl converterl like MAX232? I’m pretty sure that there should be a 3.3V levels at data lines. USB data lines operates at 3.3V as C24 module inside the phone does. thanks for this nice post. I just copied your example code and used it. The messages with the correct contents appear in the outbox, but it seems like the phone isn’t sending them. The wiring is correct and the number to which the message should be send is correct too. If i go to the outbox, “click” on one of these messages and hit “resent”, the message is send and appears at my other phone after a few seconds. I don’t really know what i am doing wrong. If you have any idea what the problem could be, would be nice if you could reply to my comment. I encountered this issue as well and unplugging the headset and plugging it back in seemed to work. Yea, i will try. Should i unplug and re-plug it while the phone is on? Or while it is off? And i forgot to ask: why do i have to use mySerial.write(byte(26)); // (signals end of message) to end a message? Is it important how long the message is? It is the ‘end of file’ part of the command. And I don’t know how the phone will act if you try to send a text message over 140 or 160 characters. Try it out and see, it might depend on your carrier too. Everything works now, thanks for the great help. I have one last question: Is it possible to send the message to more then one number? You can put the serial parts in a for loop, store your numbers in an array, and do it that way, otherwise I don’t know. However, it does not go to messaing screen, but it goes to “Calls Made” screen. Could we discuss how we can fix this? Sorry, I never ran into that issue myself so I can’t really suggest anything other than maybe factory reset the phone and make sure it works by sending a test text message from it manually. Hi thank you for such a great project!! i just had mine working and boy am i excited lol… I have a question though (and excuse my poor knowledge, im a newbie ). Is there a way i could modify this circuit so that i doesnt use a pushbutton. Let’s say i want to have the entire system self controlled and i want the arduino to send me a text message when and only when something happens (i.e. the phone runs on low battery.) how can i do that. do i need sensors, etc…. Thank you so much you are my new hero lol. Absolutely. The code is actually very basic. I suggest you read through the code reference material on Arduino’s website, and try out some of their tutorials. They’re very useful. Awesome and thanks for your quick reply. Unfortunately I don’t know how to read text messages from the phone, only send them. But if you figure it out, let me know! Thank you for the very useful article Jeff and sharing your knowledge. I can confirm that it works with the Motorola W375, which is available used for about £10 or less in the UK. Hi, I from Colombia, I have nokia X2-00, I just copied your example code and used it. The messages with the correct contents appear in the outbox, but it seems like the phone isn’t sending them. The wiring is correct and the number to which the message should be send is correct too. If i go to the outbox, “click” on one of these messages and hit “resent”, the message is send and appears at my other phone after a few seconds. I don’t really know what i am doing wrong. If you have any idea what the problem could be, would be nice if you could reply to my comment. Try step 5. I encountered that intermittently but couldn’t nail down the issue. Crash Space » Blog Archive » Found @ CRASH Space: Too Many Phones!!! Just wondering if it is possible to have the cellphone sending two sms at the same time? I’m not sure to be honest. Some phones have the ability to send SMS to more than one number, but I haven’t tried doing this. Why did you use, the pines 2,3 ? my arduino have the tx,rx in the 0,1 pines. Thanks. I’m using software serial on pins 2 and 3. The hardware serial pins are 0 and 1. The software serial is for communicating between the phone and the Arduino, while the hardware serial is so that I can monitor the output from the Arduino. Can i use this model w395 SONY ERICCSON ? is it possible from motorola C123??? I don’t know. I listed models that should work in the post, and other than that I have no idea. Thanks for sharing to all. This is pretty awesome. I haven’t tried the project, but I’m curious about why this works? I suppose the commands “AT” etc. are specific for this Motorola phone (and some others)? Do all phones have commands like this? As is, can the code be modified to do this through the headphone/mic jack of any old phone? I had no idea phones could be programmed through the headset jack. I guess you need insider knowledge about how the phone works? AT Commands are actually fairly standardized. You can control most modems with them (even modern 3G or GSM modems). The reason I used the headphone jack in this phone was because that’s where the serial connection to the phone is. The only other jack on the phone was for power. Modern phones typically won’t have a serial connection, let alone use the headphone jack for anything other than mic / headphones. If you find a phone that has a serial connection, then you can probably modify this project for that phone. hi jeff, it’s already possible to read sms with arduino? It may be possible, but I’m not sure how to do it. i’m trying to send sms with w375 and its not working. i have a mega 2560, and i changed the tx rx ports to 10 11 and nothing. I wanna ask you if I can use this code for Nokia mobiles? if not, do u know the code for Nokia mobile phones? hey , i have been trying to setup this on my nokia N70 , unfortunately nothing till now working . any suggestions ! This guide is not for Nokia phones. okay , its not for nokia , because i have to figure out the Fbus connection . right !? Nokia Phone Serial Commands | wer bastelt mit?